Piergiacomi CSP 30/1 Shears, Multi-diameter Wire stripper, pliers Very strong multi-use to..
Piergiacomi CSP 30/2 Shears, Multi-diameter Wire stripper, pliers Very strong multi-use to..
Erem 24SA Stainless Steel Curved Medium Inside and Outside Serrations Tweezer Overall Length 15..
Dissipative tweezers with fine tips, the Piergiacomi 0-SA ESD is the ESD versione of item 0-SA. ..
Tweezers with fine tips, the Piergiacomi 0-SA is ideal for use in general purpose. Tweezers len..
Dissipative tweezers with large and flat tips, the Piergiacomi 00-SA ESD is the ESD versione of item..
Tweezers with large and flat tips, the Piergiacomi 00-SA is ideal for general purpose. 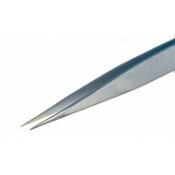 Tweezers..
Tweezers with large and flat tips, the Piergiacomi 00D-SA is ideal for general purpose. Tweezer..
Tweezers with very fine tips, the Piergiacomi 0A-SA is ideal for for watch-repairers. Tweezers ..
Dissipative tweezers with strong tips and thin blades, the Piergiacomi 1-SA ESD is the ESD versione ..
Tweezers with strong tips and thin blades Piergiacomi 1-SA is ideal for general purpose. Tweeze..
Tweezers with bent tips suitable for use for chips and SMD components. Tweezers lenght 120 mm. ..
Tweezers for handling SMD components with a 0.75mm diameter hole. Tweezers lenght 120 mm. ..
Dissipative tweezers with flat rounded tips, the Piergiacomi 2A-SA ESD is the ESD versione of item 2..
Tweezers with flat rounded tips, the Piergiacomi 2A-SA is ideal for general purpose. Tips lengh..
Dissipative tweezers with strong and thin tips, the Piergiacomi 3-SA ESD is the ESD versione of item..
Tweezers with strong and thin tips, the Piergiacomi 3-SA is ideal for general purpose. Tweezers..
Dissipative tweezers with strong tips and slim blades, the Piergiacomi 3C-SA ESD is the ESD versione..
Tweezers with strong tips and slim blades the Piergiacomi 3C-SA is ideal for use in microelectronics..
Tweezers with sharp blades and fine tips, the Piergiacomi 4-SA is ideal fo microelectronics works. ..
Tweezers with sharp blades and very fine tips, the Piergiacomi 5-SA is ideal for use in SMD rework. ..
Tweezers with very thin and sharp tips the Piergiacomi 5B-SA tweezers has got 40° curved tips for a ..
Tweezers with fine and curved tips the Piergiacomi 7-SA is ideal for a lighter grip in high density ..
Tweezers with fine tips, curved and strong the Piergiacomi 7A-SA is ideal for a lighter grip in high.. Ideal for work in small spaces and for meticulous electronic work, the Piergiacomi TR-20MD is the ES.. 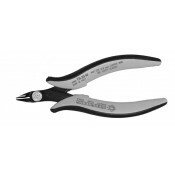 Flush Cutting Nippers Piergiacomi TR-20SM presents the same characteristics of the TR-20M but with b.. Flush cutting tool, the Piergiacomi TR-25 nippers is specially designed for meticulous electronics w.. Cutting tool overturned. Projection of the terminal cut from surface 1.5 mm. Copper wire 1,30 m.. Cutting tool Piergiacomi TR-2550 has a sharp inclination of 50°, for specific processes in electroni..
ESD version of TR-2550, the Piergiacomi TR-2550D is a tool for specific processes in electroni..